In the quest to understand the movement of our own solar system around our galactic center, the startling observation was made that most galaxies are moving away from us. Although by 1927 astronomers had succeeded in teasing out the sun’s velocity of rotation from the receding velocities of galaxies (or extragalactic nebulae, as they were then commonly called), astronomers were yet to discover a relationship between redshift and distance. To do this required accurate distance measurements, which were provided by Hubble and his observing colleague, Milton Humason. The measurement of galactic distances using Cepheid variable stars (at which Hubble had previously been so successful) did not yield enough distance data to reveal the redshift-distance relationship. Eager to extend the ability to measure distance in space, Hubble looked for ways to estimate distance without the need to resolve individual stars in a galaxy. With Humason’s work capturing the most accurate redshift measurements of the time, Hubble was able to achieve his goal. Once it had been well established that galaxies existed outside of our own Milky Way, Edwin Hubble showed how distances can be inferred from the apparent sizes and brightnesses of galaxies. Measuring exact physical distances in space is very difficult in astronomy. What Hubble needed in order to establish the relationship between redshift and distance was an accurate ordering of galaxies in space relative to one another. This is the question we explore now, in the same manner, Edwin Hubble did in the late 1920s. Start with any location in the SDSS that you like. If you already have a Special Place in the Database, go there. If not, use the Constellation Notebook to choose a location. Scan around the Navigate window. Click on different objects. Observe and record. Next, examine a cluster of galaxies. In this Expedition we will be using a particularly rich set of galaxy clusters that were studied in the late 1950s and 60s by George Abell. The coordinates for each cluster are listed below. Use the links to explore one or more of the clusters. You should be inspired to poetry; if not, just appreciate these objects by recording some thoughts and observations before moving on. Note: the coordinates listed below may not be the center of the cluster. Pan around a little to be sure you observe the entire field. As mentioned earlier, it is reasonable to suppose that a more distant cluster will look smaller and that its component galaxies will look smaller. Using visual clues from the Navigator images of the clusters, attempt to place them in order of increasing distance. You may choose to invert and print each image or do a screen capture of each for your journal. Your instructor may decide to provide the images for you. Whatever method you use, make a record of the order in which you place the clusters. We will return to this information after considering redshift. Recall that in the late 1920s there was an understanding that redshift was related to distance but exactly how had not been determined. Extending our ability to measure distances in space was the primary research motivation. At this point in the unfolding significance of redshift and distance, Hubble assumed that all galaxies within a cluster should have nearly the same redshift. Why did Hubble not expect each galaxy to have the exact same redshift? The job of determining the redshift to each cluster was primarily the contribution of Milton Humason. From approximately 1928 on, Humason worked with great precision and skill to measure the redshifts of galaxies within a number of galaxy clusters. 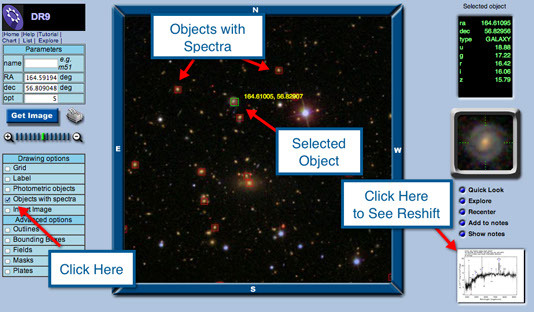 From the cluster image in Navigate, select the Objects with spectra box. In the Navigate window click on objects that have spectra (bounded by red boxes). Click the thumbnail spectrum graph that appears on the page. Locate and record the redshift (z= ) in the graph’s header. Think carefully about how you want to calculate the redshift to this cluster. Outline your methods to share with others. Calculate the redshift to each galaxy cluster using the methods you recorded. Return to your ordered list of galaxy clusters. They should be arranged by increasing distance. You could assign the number 1 to the first galaxy and so on up to number 8 and attempt to graph it with redshift. This would not take into account that we have no way of knowing if the galaxies are evenly spaced or not. Fortunately, there is one more step that we can take to make our list of relative distances reflect reality more closely. Hubble discovered that the best technique starts with identifying the brightest galaxy in the cluster. You can measure the size of the image in millimeters or pixels depending upon the tools you have available. The measurements you get are inversely proportional to the distances. More distant objects appear smaller. As a result, recording the inverse of the angular size assigns a smaller number to the clusters that are closer to us. (The smaller number represents the distance to the objects with large angular size.) This method more accurately represents the distribution of galaxy distances. Choose any technique or method available to you to measure the apparent size of the brightest galaxy in each cluster. Beware of foreground galaxies. Record the inverse of each measurement on your chart. If you want to go further on this leg of the expedition, our next step is to recreate the actual Hubble diagram. Instead of using relative distance, we move to a consideration of magnitude versus velocity as appeared in Hubble and Humason’s landmark 1936 paper, The Velocity-Distance Relationship Among Extra-galactic Nebulae.